ANCHORAGE, Alaska, Jan. 16, 2019 /PRNewswire/ -- Astranis Space Technologies Corp., building the next generation of telecommunications satellites to bring the world online, and Pacific Dataport Inc. (PDI), a company created for Alaskans by Alaskans to bridge the state's digital divide, today announced a signed agreement and commercial partnership to construct and launch the first-ever commercial Astranis satellite to dramatically increase bandwidth in Alaska and lower the price of internet access statewide. According to Broadband Now, 39 percent of Alaskans are underserved when it comes to internet access — the highest rate of any state. At a global level, more than half of the world's population today is still not online, and if current growth rates persist, more than 3 billion people in the year 2020 still will not have the fast, reliable internet most of the United States take for granted. PDI will hold a press conference and Q&A session at its Anchorage office on the morning of January 17, 2019. Members of the media who wish to attend should RSVP to astranis@theoutcastagency.com for more information. To learn more about Astranis, please visit www.astranis.com. For more information about PDI, please visit http://www.pacificdataport.com/. Astranis is reimagining the future of telecommunications satellites and taking on one of humanity's most important challenges. Four billion people do not have access to the internet. Astranis is going to change that. We are building the next generation of smaller, lower-cost telecommunications satellites to bring the world online. Astranis launched from stealth in March 2018 with funding from Silicon Valley venture capital firm Andreessen Horowitz to close the digital divide and reimagine the $126 billion a year satellite telecoms market by providing fast, reliable internet to the 4 billion people on the planet still without access. Pacific Dataport is a satellite communications company formed by Alaskans for Alaskans through a strong interest and investment by Microcom, Space Partnership International, and others. Pacific Dataport is looking to help bridge the digital divide here at home. There are very few places in the world now with internet service as poor as Alaska and this should not be the case. The fact that Alaska is being left out has presented a great opportunity for our company to not only provide ubiquitous broadband coverage to Alaska but also bring back a competitive landscape and better products that will be a benefit to all. The future of Alaska, especially rural Alaska, depends on access to reliable internet service and Pacific Dataport is ready to make it happen. Pacific Dataport is built on Microcom's strong history and knowledge of satellite communications in rural Alaska as well as Space Partnership International's experience designing and developing satellite systems. Microcom has 34 years of satellite projects to proudly look back on in Alaska and around the world, and Pacific Dataport looks forward to continuing Microcom's legacy of being the first to bring new and innovative communications technology to Alaska. Microcom has been leading the way in satellite communications in Alaska for over 30 years. Our years of dedication to customer service and competition have allowed all consumers to see a benefit from our work. Microcom is proud of its innovative solutions to our customers' communications needs. 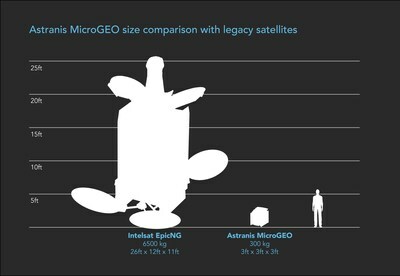 Microcom's ingenuity has resulted in many "firsts" in the satellite industry. Today, Microcom installs and services commercial satellite television and internet terminals across its vast territory. Microcom looks forward to continuing our work at pushing the boundaries of satellite communications technology. Space Partnership International (SPI) is a multi-disciplinary management consulting firm for space-related technical and business initiatives; our areas of expertise include satellite systems engineering, Business Development, procurement support / program management, ITU regulatory and market access. SPI brings together a multicultural team of experts with experience building and operating space-related businesses all over the world. We help government agencies, as well as start-ups and established companies across the entire satellite value chain and project lifecycle to create opportunities and bring them to fruition. For more information, see www.spacepi.com. SOURCE Astranis Space Technologies Corp.